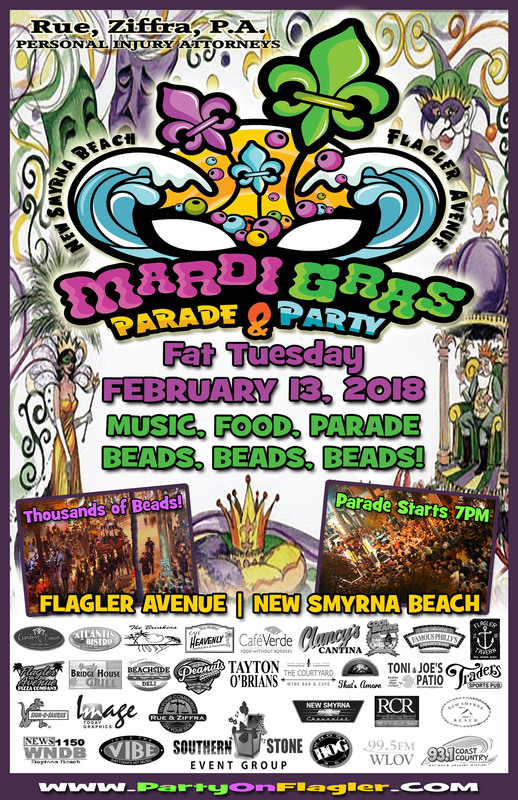 Let the Good Times Roll at the 10th Annual Flagler Avenue Fat Tuesday Mardi Gras Parade on Tuesday, February 13, 2018. The parade will travel from South Atlantic Avenue beginning at Columbus and turn south on Flagler Avenue and end on Pine Street. Celebrate Fat Tuesday with the parade, Mardi Gras-themed music and food specials at 10 venues along the Avenue. The parade route will be closed to vehicular traffic from 5 – 8 p.m. Cars also must be moved from the street to accommodate the large crowds. If you prefer a to fill out a paper copy, you can download it here. You can drop it off at the Drita Travis at 307 Due East Ave in an envelope in the mailbox or email it to partysonflagler@gmail.com.